I like Five Guys. Even though they’re a rapidly growing chain, they started out small and they’ve stuck to their roots. 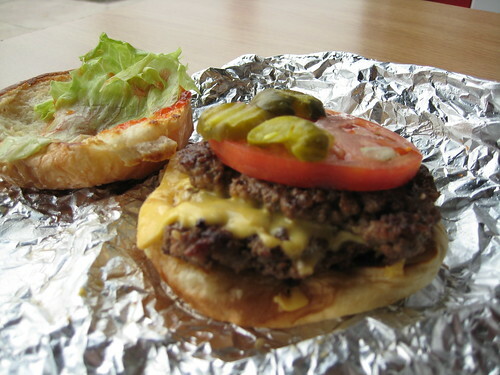 Formally named Five Guys Burgers & Fries, they do burgers and fries really well. Technically there are hot dogs, grilled cheese, and veggie sandwiches (just toppings on a roll, minus the burger) on the menu, but I’ve yet to order them and haven’t seen anyone else who has. They don’t bother with milk shakes or onion rings or mozzarella sticks or salads or anything else, nor do they have plans to. It’s really just about the burgers and fries. The burgers are cooked through but are loosely packed, so you’ll only wait a few minutes at most for your burger and it will retain its juiciness. The bacon cheeseburger (pictured below) is $5.59, making it the most expensive thing on the menu. Pretty cool. The stick a few half-slices of bacon on the bottom. I like bacon so I’d probably forgo it next time, opt for a cheeseburger and load up on the toppings. I can get better/more bacon elsewhere, plus it’d knock the price down a little bit. Most locations are similar. Table and chairs, tile walls (no doubt for easy cleaning), bags of fresh potatoes lining the wall near the counter, boxes of peanuts for customers to munch on while they wait. They do have signs inside that instruct customers not to take peanuts outside the building to protect those with peanut allergies, but I don’t remember seeing any signs going in warning allergy sufferers of the peanuts inside. If you have peanut allergies, this is not the place for you since there’s broken shells everywhere. You might consider Cheeburger Cheeburger or Fuddruckers instead. For everyone else (or those who will risk it), just figure out what you want and get in line. As soon as you place your order with the cashier, he/she will call back to the grill man who places pre-formed patties of raw beef on the grill (or a single patty if you ordered a “Little”). On my last visit I saw a runner bringing two trays of red — not brown — beef patties from the back, visual proof of the “our beef is never frozen” mantra. Meanwhile another guy gets busy lacing the sesame seed bun with any number of the 15 toppings (currently limited to mayo, relish, onions, lettuce, pickles, tomatoes, fried onions, sauteed mushrooms, ketchup, mustard, jalapeno peppers, green peppers, A-1 sauce, BBQ sauce, and hot sauce). At the same time, another guy is throwing fresh-cut potatoes into the fryer. Everything comes together at the end with your burger assembled, wrapped, and tossed in the bag with an extra scoop or two of fries. Unlike other establishments where the kitchen is buried as far away from the customer as possible, Five Guys has an open air kitchen; you’re free to observe the entire process. Everyone behind the counter has a job to do, in their own space. It’s a very organized and well thought out operation, made possible by their limited menu. I don’t know how Five Guys got it’s name, but they really only need five people working at any one time. Grill, fryer, cashier, toppings, and running/cleaner. Maybe that’s just a coincidence. I have this rule about dining out where I don’t buy something that I could easily make at home. In the back of my mind the cost figures into it, but mostly it’s the time of making the meal, cleaning up afterward, and how it’s going to taste. Unless there’s some incredible sauce or meat added, I’d never order pasta at a restaurant. I just can’t justify spending $8-10 on a plate of paste drowned in watered-down red sauce when I could put four servings of the same thing together at home for less than $3 while only dirtying two pots. Sometimes you have to break your own rules. Sometimes you crave a burger and fries. Fortunately there’s Five Guys. Mmm… like an East Coast version of In & Out Burger, except way, way better. I love this place. I usually go to the one in White Marsh, over near the Lowe’s, but it looks like they’ve FINALLY opened the one in Carney, on Joppa Rd in the Safeway shopping center (where Bill Bateman’s and El Salto are located). Try the Cajun fries once in awhile. Five Guys is really, really good. I took a coworker there for his first time this week and he loved it. The owners, Janie and Jerry Murrell, named it for their five sons. Jon: I WILL fight you. Jon: You think it’s better? I’ve heard a LOT of people rave about In-N-Out. Claude: The cajun fries are tasty. I didn’t get any fries this time around, but usually if a few people order we get a big tub of each kind of fries. The more the merrier. yellojkt: That’s the way to do it, especially if work is paying. Tamra: I should have Googled. Meantime we’ll have to get together for lunch. jwer: I’ve never been. The nearest In-N-Out Burger is at 3711 E. Broadway Boulevard in Tucson, AZ. I’m all about trying In-N-Out Burger to give it the fair shake, but traveling just under 1,965 miles is a bit of a hike. - In-n-Out has been open since 1948. Five Guys since 1986. That doesn’t inherently mean In-n-Out is better, I realize. - I can’t find prices online, but I feel like In-n-Out is a little cheaper. - In-n-Out employees are always super friendly and helpful, whereas, at least at the Harbor Place one, the Five Guys employees are kind of surly and rude. - The In-n-Out Foundation gives money to prevent child abuse. i cant believe you’ve had such a conversation on this. you cannot compare something exclusively west coast with something in Maryland.. variety is the spice of life.. enjoy what you get where you get it.. and who cares where that is.. if you insist on doing so, you just cant enjoy everything.. you need to travel more and learn to except a burger is a burger.. and geography makes it interesting.